Welcome home: Speaking of "home," now that Charlotte is what I consider to be my home, my roommate and I have decided to throw a housewarming party to celebrate our new apartment! It will be held the weekend before I go home to Maine. I am so excited! I've had very few friends over so far to see the new place, so this will be a good excuse to both entertain, and finally finish decorating our apartment! If any of you have hosted successful housewarmings before, please send any links to Pinterest boards or pins that might be helpful my way! Reading for fun: The first thing that I did after getting my North Carolina license was to finally get a Charlotte library card! This has been such a treat. I adore reading, but it's something that I barely had time to do for pleasure during my college years. My current nannying job allows me time in the afternoons to read while the girls that I watch are at swim team practice, so I have been reading multiple books a week, and it is glorious! The first thing that I did was to check out several books that I hadn't previously read from Karen Kingsbury, my favorite Christian fiction author. I was obsessed with her books in high school (and I even got the chance to meet her during my freshman year of college!). During my next trip to the library I plan to visit some of the other book sections- the library near me is huge and has so much else to offer! Uptown event: Be sure that you're following me on Snapchat @miss_alk - tonight I have the privilege of attending a super fun event taking place right in Uptown Charlotte on behalf of my blog! I am bringing fellow Charlotte blogger and my new friend Amy from Pastel n Pink along with me as my guest. It should be an awesome evening! I will try and do a recap post soon here on the blog. Going to be totally honest in this category for this week, this was just one of those weeks where "adulting" expenses took the majority of my paycheck, and I didn't really get to spend money on myself (unless you count eating out a few times... okay maybe more than a few times... ha!). My roommate and I made a much needed trip to IKEA on Monday evening, and I purchased some of the last few furniture and kitchen items that we needed for the time being. We also have rent and utility bills coming due this week. I have always wanted Southern Belle in Training to be a blog based around affordable fashion, but sometimes a love of fashion, even when done affordably, has to come second to more important expenses. I always strive to be honest with y'all in each stage of my life! It's something that I wish more bloggers would do. Hope that everyone is having a great (four day) week! Have fun in Maine with your family and good luck with that long drive back! "Adulting" expenses get to me also! Have fun in Maine! I need to check our Karen Kingsbury! I love Christian fiction books! Have you read the "Left Behind" series? Isn't it great having time for pleasure reading?! Have fun going back home! Last night was so much fun! Also, always love how honest and real you are with your posts. Having a electricity > new dress! Love this post! I think it's great when bloggers keep it real. Ikea trips are always fun. So many great things for making your space cozy. 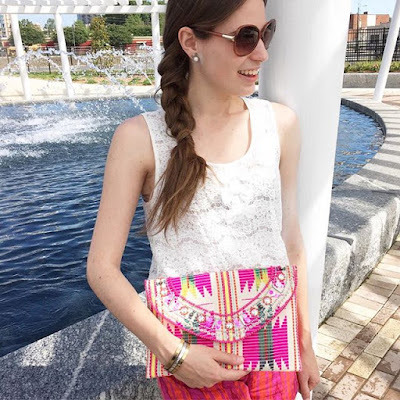 love the clutch and such a cute post! I'm sure the memories from the road trip with your mom will stay with you forever! It's been so fun seeing updates from you about your new apartment! I hope your housewarming party went well!